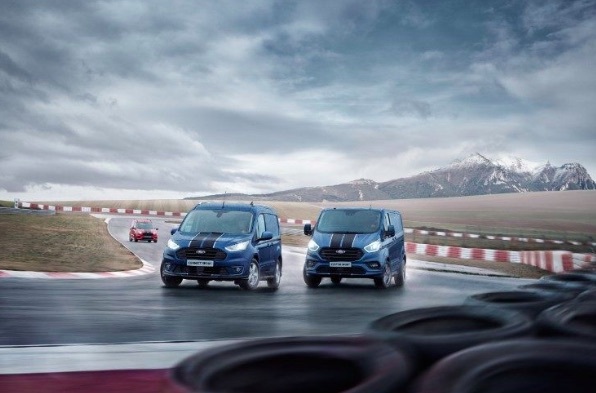 Earlier we reported about the new European-only 2019 Ford Transit Custom Sport and Ford Transit Connect Sport. The Ford Transit Courier Sport is the third of the new Transit Sport vans for the European market and we want you to know all about it. Not to be confused with the upcoming Ford Courier pickup, the Ford Transit Courier Sport is a van for the Euro market, and joins the sporty family of fun and functional Ford vans. The new vans are complete with easily identifiable sports stripes, body-side moldings and wheel arch extensions. The compact but capable Ford Transit Courier Sport has the ability to make a big statement for businesses and urban delivery service companies. Styling highlights include the aforementioned sports stripes as well as a color-coded body kit. Under the wider fenders are 16-inch alloy wheels finished in silver. The Courier is seen to the left in both photos, above and below. Inside of the Courier Sport are partial leather sports seats with red contrast stitching for added flair. Convenience features include a 4‑inch color screen with SYNC 3 integration, and rear parking sensors. Under the hood is a 1.5-liter diesel engine that produces about 100 horsepower, and is paired to a six-speed manual transmission. For those that prefer a gasoline engine, Ford will offer the Courier Sport with a 1.0-liter EcoBoost engine – also making approximately 100 horsepower. Ford delivered its best commercial sales in 25 years in 2018, with 380,900 commercial vehicles sold in its 20 European markets. In comparison, Ford sold 127,360 Transit vans in the United States in 2017, and 137,794 in 2018.